Reiki: The boundless, universal aspects of life force energy that flow through all living beings. Reiki is a form of natural healing that dates back thousands of years to India and Tibet, long before being rediscovered in the early 1900s by Dr. Mikao Usui. Using universal-guided life force energy, it promotes balance; harmony with self, the universe, and God; and healing—physically, emotionally, and spiritually. Gentle, safe, and natural, Reiki can be practiced on its own, along with other alternative therapies, or in conjunction with conventional medical treatments. The practitioner places their hands on or slightly above your body, using different hand positions. Spiritually guided, the energy flows wherever it is required, and each hand position is held until the practitioner feels the flow of energy has slowed or stopped. When receiving Reiki, you will usually feel very relaxed; you may even have a floating sensation. You may also feel heat, a tingling, or even cold under the practitioner’s hands. These, and other feelings, come from what the Reiki energy is actually doing in and around your body—adding energy, balancing, and/or removing excess energy and blockages. You might also experience different emotions, thoughts, or visions from which you can gain insight, perhaps then being able to release something that no longer serves you. After treatment, many feel refreshed, relaxed, cleared, and more content. 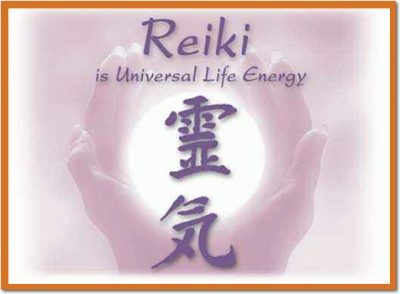 Usui Reiki is suitable for all living beings—people, animals, plants, crystals, Mother Earth, and the Universe—and can also be placed in objects such as towels, food, water, and clothing, each of which can then be used for healing purposes.